Welcome, you've found the most inovative Property Managers on all of Delmarva! We offer services for vacation rental owners who need assistance managing the details of their rental business. From websites, marketing, housekeeping, and emergency services - we can help you rent with confidence and peace of mind. As a property owner, or potential property owner, you’ve obviously fallen in love with the beach, just as we have. Seaside Vacations was founded with the belief that there was a better way to provide outstanding service, implement market leading technology, and provide the very best Eastern Shore Vacation experience possible all while providing value to both our Partners and Guests. Fully Responsive Website - Over the past few years Mobile Traffic has shown a tremendous growth rate and will soon lead traditional desktop traffic. Our website is fully responsive and was built to function properly on any device, be it desktop, laptop, tablet or mobile. Multi Channel Marketing - We put your property in front of quality guests. We use a variety of Listing Sites, SEM, SEO, ReMarketing, Email Campaigns, Social Media and many other tools to put your property in front of the Guests you want in your home. *We now feature direct integration with all major listing channels. Professional Quality Photos - Today’s consumers shop with their eyes. High quality images are simply more visually appealing. Layer in Matterport 3D virtual tours, drone photography, and professional video, and you have a combination that can't be beat! Well Written Property Descriptions - We’ll make your property stand out from the crowd. Every home has a story begging to be told. Let us help you bring your homes story to life. Instant Email Response - Our inquiries are answered instantaneously, we suggest similar properties when someone inquires about a listing that is not available for their date range. Check-ins and Check-outs - Our guests love our Express Check-In. They simply go straight to the property. They’ve spent enough time in traffic. We don’t want them to wait in another line; let's have them get right to their vacation. Electronic locks offer more security and peace of mind to both our owners and guests. Who wants keys to their home floating around. We have an electronic lock solution for nearly every door. Property Care - We inspect each unit before and after each stay. Our guests demand a clean, comfortable place to enjoy their valuable vacation time. It’s simply our obligation to make sure that things are ready for their arrival. Vacation Planning - We work with each of our guests to help them make the most of their stay with us. Housekeeping - We work with only the best housekeepers in our market. Housekeeping is scheduled by us, and we pay them from the Owner’s account. All vendors that we used are licensed & insured. Minor Maintenance - You won’t see the “nickel and dime” charges from us. If light bulbs and HVAC filters are stocked in your unit, we replace them free of charge. We don’t have a “service fee” in our system. After Hours Emergencies - Seaside Vacations handles all after hours communications. These services are just the beginning. We are a small company which gives us the bandwidth to pay attention to every detail of your property and the guests vacation. We monitor the market daily to provide you maximum yield and maximum occupancy. You are a Partner, not a number with us. To learn why Seaside Vacations is the best choice to manage your Vacation Rental Assets, call Lance today at 844-662-2583 or email at [email protected]! What do our owners have to say about us? "We are truly grateful to have found Seaside Vacation rentals! What started as a chance meeting on Main Street, has turned into a perfect fit! Lance and Elaine have been so helpful to us as owners, helping us with multiple things that pop up and are always keeping us updated on our property when storms hit or issues arise which is difficult for us to manage being so far away. One instance was I woke up to a broken water line outside and was having a difficult time finding a plumber on such short notice, called Lance and Elaine and within the hour a plumber was there, the problem was fixed and didn't cost an arm and a leg! We knew then that if they took care of us as owners then they would surely be excellent with our renters!" 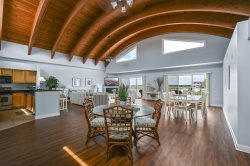 Kelly M.
"Lance was primarily responsible for the management and rental of our vacation property in Ocean City Maryland. From day one, Lance was available and easily accessible for any questions or issues that needed to be addressed. He was responsive and always answered his calls immediately or within hours, which as an owner I appreciated. He went above and beyond in making us feel that our property was a priority to him. Lance was also present at our community wide meetings to address any questions or concerns from not only those whose properties he managed, but to be available for any concerns our neighbors had. This went above the call of duty in my book! I know Lance will create a team of individuals who share his service philosophy and that team will deliver the same service in the future." "While working with Lance to rent my two units at the Meridian he's always exhibited extremely high ethics, impeccable accountability and the willingness to help out in virtually any capacity. Lance is trustworthy, conscientious and, above all else, dependable. You can trust Lance with your property." Rick H.
"Elaine is one of those rare individuals whose multiple talents are only surpassed by her unerring ability to make people feel at ease. She is a talented technician, an ever observant listener, and someone whose integrity and wisdom are beyond question. There are only a few people whom I know who possess all of these positive attributes." James L.